Most people don’t come to the gym with the intention of building lots of muscle. They come to lose some weight, ‘tone up’ and get fit. The idea of muscle building conjures images of huge, rippling bodybuilder types or grimacing meatheads under unfeasibly heavy bars – not something most people aspire to. Strong and healthy, not jacked and tan! But to associate muscle building solely with these extreme examples is to miss a host of important benefits. Ignoring muscle building because you are afraid of getting too ‘big’ is throwing out the baby with the bath water. And here’s why. Our musculoskeletal system is what enables us to move, from simple movements such as sitting, standing and walking, to explosively lifting a weight over our heads. As we grow from being children, to teenagers, to young adults, our bodies build muscle without us having to think about it. By adulthood, about 40 per cent of our total body mass is muscle. So far, so good. But after the age of 35, we lose our muscle mass at a rate of around 5-10 per cent per decade (source: NASM). Unless we engage in physical activity to prevent this, of course. I am sure you have noticed that body weight tends to increase with age, especially after you hit thirty. But if muscle mass is declining, that extra weight can only be fat. Increased fatness and weakness – is that really all we have to look forward to after our thirties? This descent into fatness and weakness is not inevitable. We can reverse it by focussing our efforts on muscle building. Still not convinced? The diagram below illustrates what I am talking about. This is what muscle building really means for the normal person who wants to stay in good shape for as long as possible. 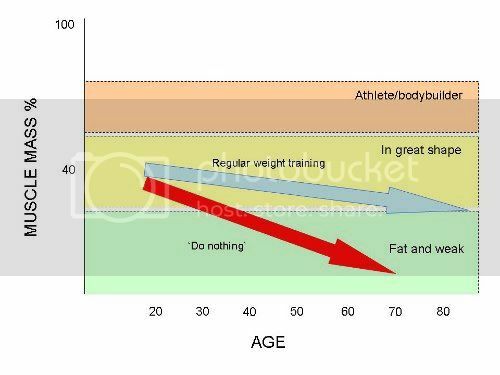 The red arrow represents the ‘do nothing’ scenario: no weight training and bad diet leads to loss of muscle mass and increase in body fat and weakness. The blue arrow is the ‘regular weight training and decent diet’ scenario, holding off the decline of muscle mass for as long as possible. And why should we be so concerned with our muscle mass? Having strong, engaged muscles enables us to move freely; to play with the kids or set off on an active adventure. Even to do home improvements without worrying about dropping stuff or putting your back out. It’s never too late to start. I knew a woman who took up olympic weightlifting in her seventies. 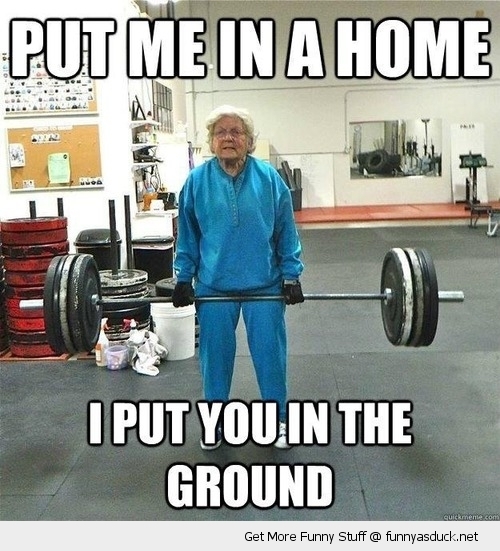 And I know of at least two ladies who took up powerlifting in their nineties! A landmark study done in 1995 on women in their sixties found “high-intensity strength training results in substantial, continual increases in strength in postmenopausal women”. It’s not just about muscle either. As we get older, bone density decreases just as muscle mass does. In women, bone loss is much more prevalent after menopause and women are at particular risk of osteoporosis. Reduced bone density makes bones weaker and easier to break. The skeleton also collapses, leaving us with bad posture and all the problems that leads to (such as Widow’s Hump, where the spine has fractured due to bone loss). However, resistance training strengthens bones. When we lift weights or apply a resistance, it stimulates our bodies to increase bone density in order to cope with higher forces. But is muscle building really for me? Yes! If you want to live a strong and healthy life. We all know about the benefits of ‘cardio’ – our media is saturated with images of smiley older people out for a jog to keep ‘heart healthy’. But what is not touted in the media is the benefits of resistance training. However the NHS has now upgraded it’s exercise guidelines for all adults to include at least 2 sessions a week of strength exercises. Society at large is still catching up with this idea. I know that muscle building works – I’ve done it myself and met hundreds of people who have also benefitted from it. You don’t need cardio, you don’t need to starve yourself. Regular weight training and a good diet will keep you in shape for decades to come. 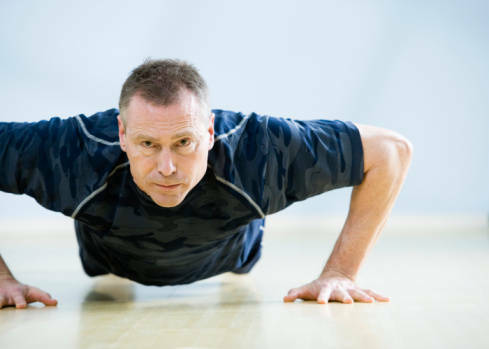 More older people are seeking out personal trainers and getting their physical strength back. I’ve also noticed an uplift in middle-aged clients who are thinking ahead and wanting to set themselves up for a healthy older age. Very sensible! It’s never too late to start, but the earlier you start, the better. 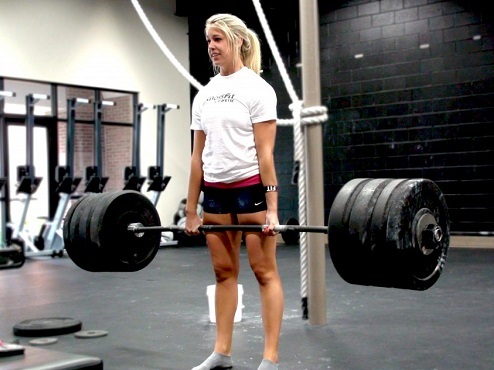 There are many different techniques in weight training, to meet many different goals. You can use dumbbells, barbells, kettlebells, bags of sand, or your own bodyweight. The tool doesn’t matter, what matters is that you train to develop muscle.